Grow in moist, well-drained loams in full sun. Performs well in sandy soils. Established trees have drought resistance. Castanea sativa, commonly called Spanish chestnut or sweet chestnut or European chestnut, is a large, pyramidal-rounded to broad-columnar deciduous tree in the beech family that typically matures to 80-100’ tall with a substantial trunk growing to as much as 7’ in diameter. It is native to high forest areas of western Asia from Iran to the Balkans. Edible chestnuts have been cultivated from this tree for human consumption since ancient times. Today this species is grown throughout much of Europe, northern Africa and southwestern Asia. Growth is widespread in Great Britain where this tree was first introduced during the Roman occupation. Spanish chestnut was first planted in the eastern U.S. in Delaware in 1803. It was commonly grown for almost 100 years without problems until a deadly chestnut blight (Cryphonectria parasitica) invaded the U.S. via a shipment of nursery stock from Japan in the late 1890’s. The American chestnut (Castanea dentate), once a major component of the eastern U.S. hardwood forest, came under severe attack from this blight which became a death sentence for that species. Spanish chestnut was for a short time considered to be a possible replacement in the eastern U.S. for the doomed American chestnut, but unfortunately Spanish chestnut was also susceptible to the blight, albeit to a lesser extent. Although some naturalized pockets of Spanish chestnut continue to grow in a few eastern states including Massachusetts, New York, Pennsylvania, Kentucky and Alabama, the species is not commercially grown there as a food crop. U.S. commercial growth is now limited to a small number of areas in western states where the blight is not yet a serious problem. Chestnut blight appears to be much less aggressive in the cool and wet summer conditions in many parts of Europe that it is in the eastern U.S. The vast majority of chestnuts consumed as food in the U.S. today are imported from Spanish chestnut cultivars/hybrids commercially grown in Europe (most from Italy). 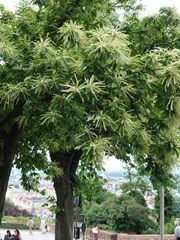 Spanish chestnut features coarsely-toothed, oblong-lanceolate, dark green leaves (to 6-10” long), each leaf having about 20 pairs of prominent parallel veins. Leaves are slightly furry with a lighter green color beneath. Leaves turn yellow in fall. Tiny, densely-clustered, monoecious flowers bloom in yellowish-green catkins (each to 4-8” long) in early to mid-summer. Flowers in the mid to upper portions of bisexual catkins are males, with a much smaller number of female flowers appearing at the base of such catkins. Pollinated female flowers are followed by prickly husks, each containing 3-7 brownish nuts which fall from the tree in October. Although C. sativa has separate male and female flowers on the same tree, these flowers are largely self-incompatible, thus more than one tree is normally planted in order to produce nuts (assuming nut production is a goal). Purplish-gray bark develops fissures with age. Growth of chestnut trees in many parts of North America today is perhaps best done with blight resistant species such as Japanese chestnut (C. crenata) or Chinese chestnut (C. mollissima) plus a number of blight resistant hybrids. Genus name comes from the Latin name for this tree which was derived from the town of Castania in Thessaly where the trees reportedly grew in abundance. Specific epithet comes from the Latin word sativa meaning sown or cultivated by humans (as opposed to wild). Common name of Spanish chestnut probably derives from the fact that some of the best chestnuts imported into England many years ago were grown in Spain. Chestnut blight (Cryphonectria parasitica formerly Endothia parasitica). Development of blight-resistant cultivars and hybrids has been a priority for some time. Also susceptible to leaf spots, anthracnose and powdery mildew. Large nut-producing tree that unfortunately is susceptible to chestnut blight. Grown for production of edible nuts and/or ornamental value. Matures into a dense shade tree. Needs adequate space. For ornamental use, it is best located in areas where litter from the tree (nuts falling to the ground) and unpleasant pollen aromas will not be a problem. Excellent tree for parks and large gardens. For culinary use, nuts may be roasted over a fire or preserved in syrup as the popular French delicacy called marrons glaces.